"Goalie Henrik Lundqvist #30 of the New York Rangers is illuminated by the Washington Capitals logo as he stretches out before playing the Capitals in Game Four of the Eastern Conference Semifinals during the 2015 NHL Stanley Cup Playoffs at Verizon Center on May 6, 2015 in Washington, DC." The problem with remote cameras is they're a gamble. Some games nothing comes together. Other games there are multiple pictures. Yet even when they are lots of images to transmit, some just don't tell the story of the night. This is one of those images that maybe didn't tell the story for the night, but I liked enough to share another overhead remote image from the same game. 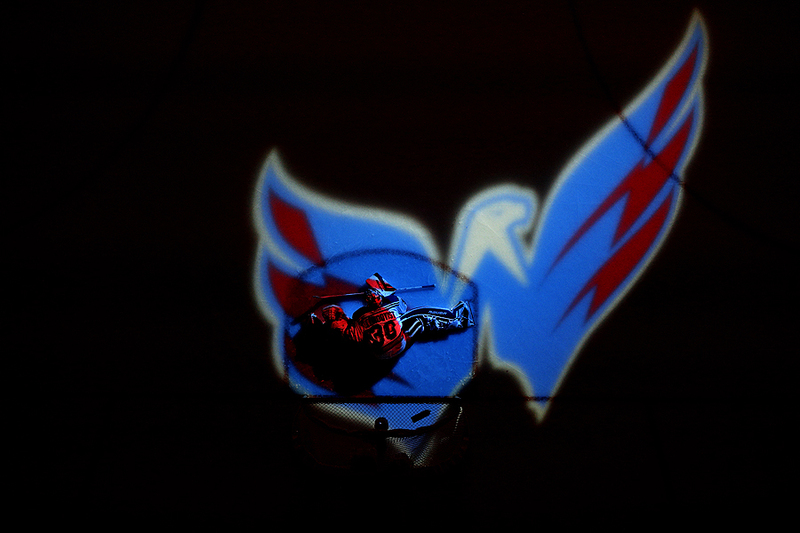 Before the New York Rangers played the Washington Capitals in Game Four of the Eastern Conference Semifinals during the 2015 NHL Stanley Cup Playoffs - superstar goalie Henrik Lundqvist stretched out and was illuminated by the Caps logo. Going into Game Seven the goal tending will continue to be an import role in the series, Lundqvist just hopes he won't be in the wrong spotlight.